Imagine you’re sitting at a beach-side restaurant in Mexico munching on freshly made tortilla chips with scratch-made guacamole and salsa – perhaps a tequila chaser on the side. The sad reality is both of us are probably reading the paper or pecking away at our computers, watching the snow slowly melt into gray puddles. I, however, am brushing freshly made tortilla chip crumbs off my keyboard. I may not have the beach scene, but I’m enjoying authentic tortilla chips, practically out of the oven, which were recently made from scratch at The Ann Arbor Tortilla Factory. I’m thinking outside of the salsa bottle for tonight’s dinnerFeed, using any chance I can get to enjoy these chips. A chopped, tossed salad sounds particularly appealing. A tostada generally refers to a flat or bowl-shaped fried tortilla, often salad ingredients fill these “bowls.” Ann Arbor Tortilla Factory chips lend the flavorful crunch you’d enjoy from a tostado shell. l love the food options in this town, even though we sometimes have to walk over broken glass (i.e. ice) to purchase them. If you know of any other small town in America’s Midwest with a company making its own “scratch-made” chips, let me know. You can find these addictive little devils in various flavors at most groceries in town. Chopped cilantro, sliced olives and corn kernels would be delicious tossed with this salad, too. 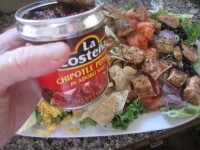 To save time you may purchase a bottled Southwest-styled salad dressing. *Pre-made taco seasoning or a combination of ground cumin, chili powder, kosher salt and cayenne. **I always freeze the remaining peppers in individual baggies. Cut off white tendon from end of tenders and discard. Toss chicken strips with 2 tablespoons seasoning mix. In a large sauté pan, heat oil over medium heat. Add chicken tenders and sauté until cooked through, 3-4 minutes on each side. When cool enough to handle, cut into bite-sized pieces. Refrigerate until ready to compose salad. 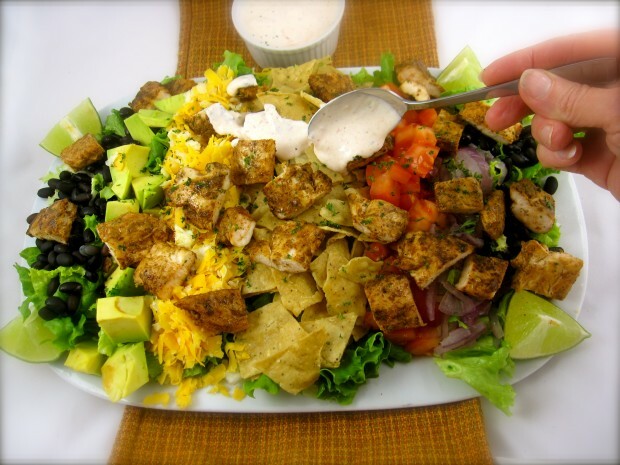 On a large platter or in a salad bowl, arrange, layer or toss together lettuce, tortilla chips, black beans, tomato, avocado, onion, cheese and chicken. Meanwhile, in a food processor or blender, process lime juice, sour cream, chopped chipotle and 3 tablespoons water until smooth.